Deadline: April 22 We seek a Community Engagement Coordinator to engage members, partners, and anyone who enjoys being in the outdoors in community events, on social media, and as volunteer trail stewards on our 8,000 acres of preserves and easements in Hancock County. This is a full time, 40 hour per week position. For more information . . .
FBC seeks an energetic summer intern to join our team of four full-time staff and one seasonal AmeriCorps Member to enhance the field projects at our Preserves that our dedicated team of Stewardship Volunteers focuses on for the Wednesday Work Days. Expectations are that this individual will work well with others, conduct themselves professionally at . . . In Maine, wildlife is almost ready to wake up from a long winter’s nap. Other critters will begin flocking north as the leaves emerge and flowers bloom. Birds are one of the key indicators that tell our eyes and ears: it’s spring again! We’re happy to conserve habitat for “Woody”—the summer spruce grouse at Frances . . .
At the beginning of December, Frenchman Bay Conservancy announced that it had received a $94,500 grant to protect a 17-acre parcel on Hog Bay in Franklin. The grant came from the Maine Natural Resources Conservation Program, as noted on Maine Public Radio “Maine Conservation Programs From York to Aroostook Get Help.” Local papers wrote with . . . The tidal mudflats of Hog Bay are rich with life. The extensive area exposed at low tide includes natural habitats for horseshoe crabs, waterfowl, and other wildlife. Now a portion of the bay’s forested coastline and valuable bird habitat will be protected from waterfront development. Thanks to a $94,500 grant awarded on November 29 from . . . Although the course was wet, the weather on Sunday was all sunshine and over 70 runners came out to Sumner Memorial High School in Sullivan to test their trail running skills! For the past six years, Jennifer Britz of Bar Harbor has claimed the Double Trouble Challenge prize for the top female trail runner in . . .
Downeast Conservation Network is searching for a new network Coordinator. DCN is a regional network partnership of conservation, research, and education organizations working in Hancock and Washington Counties, Maine. Our mission is to connect conservation, research, education, and communities in Downeast Maine. The DCN Coordinator works with a 15-member Steering Committee and regional partners to . . .
Public Notice The land trust accreditation program recognizes land conservation organizations that meet national quality standards for protecting important natural places and working lands forever. Frenchman Bay Conservancy is pleased to announce it is applying for renewal of accreditation. A public comment period is now open. The Land Trust Accreditation Commission, an independent program of . 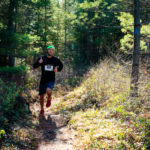 . .
Now you can follow the 4-mile (orange) and 8-mile (blue) routes on the Baker Hill, Long Ledges, and Schoodic Connector Trails to train for the upcoming Autumn Trail Race. Maps and more information. Autumn Trail Race . . .